At a fundamental level, the shutter speed you use when capturing a photo primarily determines how motion is conveyed in the image. But how do you decide which shutter speed is best for a given scene? With a very fast shutter speed you can freeze motion. Not only does this provide an image with a high degree of perceived sharpness, it can also provide a view we are unable to see in the real world with our own eyes. For example, if you watch a bird dart quickly across the sky, you won’t be able to make out fine details with your own eyes. But a photograph captured with a fast shutter speed will freeze the motion of the subject. A shutter speed of 1/1500th froze the motion of this fast-moving bird. The shutter speed required to freeze motion will, of course, depend on the speed of the subject you’re photographing. Keep in mind also that with a telephoto lens the speed of your subject will be amplified, requiring a faster shutter speed to freeze motion than would be necessary with a wide-angle lens. When you want to freeze motion, a good starting point is a shutter speed of 1/500s or faster. For especially fast-moving subjects you might need to use an even faster speed in order to freeze the motion. Stopping the motion of a fast subject, or avoiding a blurry photo when you are photographing from a fast moving vehicle, you may need to use a shutter speed of 1/2000s or faster, perhaps even opting for the fastest shutter speed your camera is capable of. Of course, just because a subject is moving quickly doesn’t mean you’ll want the fastest shutter speed possible. For example, I often photograph crop duster aircraft spraying fields in the Palouse region of eastern Washington State. These planes are moving at high speed, so it seems logical that you would want to use an extremely fast shutter speed. In actual fact, with a propeller-driven airplane, it is preferred to have a little bit of motion blur visible for the propeller, so it doesn’t appear the engine has failed. That often means using a shutter speed that is no faster than about 1/250s, even though that means a perfect panning technique will be required to ensure the airplane is sharp while the propeller exhibits a bit of blur. A very fast shutter speed stopped the propeller of this crop duster making it look like engine failure. Even when a subject is moving, you don’t necessarily want to freeze that motion. In fact, you might want to emphasize that motion by allowing the movement to be blurred in your photo. Allowing the movement within a scene to appear with a motion blur in a photo can impart a dynamic quality to your image. Taking that a step further, you can create a more subdued feel for an image by slowing down the shutter speed so that the motion produces an ethereal blur in the image. A 15-second long exposure creates an ethereal feel in a flowing river. How much you need to slow down the shutter speed depends in larger part on the rate of movement within the scene. In addition, you’ll need to use a slower shutter speed when using a wide-angle lens than you would to create the same sense of motion you would achieve with a telephoto lens. As a general rule, to impart a sense of motion in the scene you’ll generally want to use a shutter speed of 1/10s. When the motion within the scene is relatively slow, you’ll need a slower shutter speed to get a sense of motion in the photo than would be necessary with fast motion. Also, if you want to create a more ethereal image where all areas of motion are completely blurred, you’ll need to use an even slower shutter speed. For a more ethereal effect, I recommend getting started with a shutter speed of about ten seconds or longer. With moving water, for example, I often use shutter speeds of about 15 to 30 seconds. When photographing moving subjects, I find that many photographers have a tendency to either use a very fast shutter speed to freeze motion, or a very slow shutter speed to create a dramatic blur effect. It is worth noting that shutter speeds in between these extremes can provide excellent results. 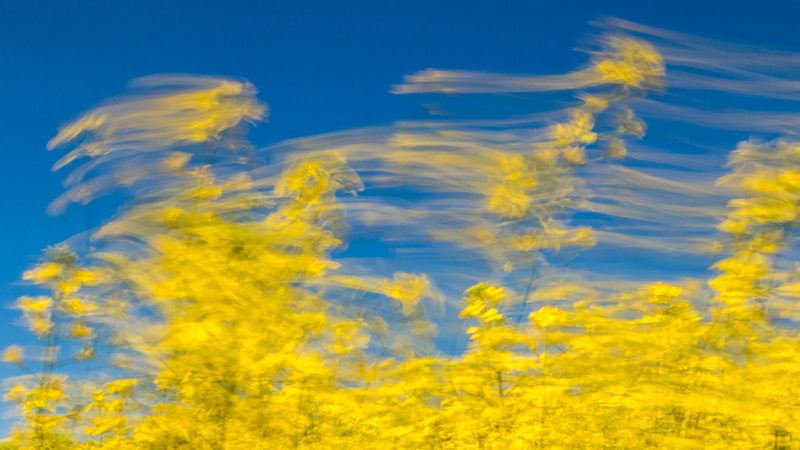 A shutter speed of 2/3 of a second was neither too fast nor too slow, creating an interesting blur effect for these canola flowers. For example, I was recently photographing a field of canola flowers on a windy day. Freezing the motion of the flowers required a shutter speed of 1/4000s or faster. Using a shutter speed of 10 seconds or more produced an extreme blur of colors, with no texture at all. Setting an “in between” shutter speed of 2/3 of a second produced a balanced amount of blur that created a look something like a painting. For any given scene there isn’t a single “right” shutter speed to use. First, you need to decide the extent to which you want to freeze versus blur motion in the photo. Based on your own artistic sense, you’ll then need to find a shutter speed that provides your preferred effect for the motion of the scene. To be sure, a bit of trial-and-error can be required to find the right speed for a given situation. With practice, you’ll get better at anticipating what shutter speed will work based on the speed of motion within the scene. But I also encourage you to experiment with different shutter speeds to see how you like the varying effect from one image to the next. Achieving a particular shutter speed will require adjusting other camera settings. You may need to open up the aperture, increase the ISO setting, or use flash illumination in order to adequately freeze motion in a scene. Conversely, you may need to stop down the aperture, reduce the ISO setting, or even employ a solid neutral density filter in order to achieve a slow enough shutter speed. By experimenting with different shutter speeds when photographing a variety of different subjects, you’ll start to gain a greater appreciation for the important role shutter speed can play in creating a photographic image you’re proud of. Along the way, you’re sure to have fun exploring all of the different possibilities made possible by changing your shutter speed.